The purpose of this new report from Conservation Finance Network is to showcase how environ­mental markets do not emerge in a fully functional state but are built incrementally. It also shows how public, private and philanthropic groups each have unique roles to play in con­tributing to this market development over time. Attempts to recruit private capital into conservation often start out as a cluster of public, private, nonprofit and philanthropic groups all working to try to get a new environmental good or service appropriately measured, valued, bought and/or sold. The most promising business models among these must be tested, vetted and scaled before market consolidation can occur. This report translates practitioner insights into a framework and common language to describe the way in which conservation finance markets materialize and mature. The report aims to socialize and expand the body of knowledge on market development by capturing and disseminating findings from an ongoing series of convenings, the Conservation Finance Practitioner Roundtable. The resulting market development framework is intended to serve as a road map and decision support tool for conservation investors, public agents, foundation professionals, and environmental practitioners alike. It is designed to help market participants set realistic goals, expectations and timeframes for deliverables and objectives. 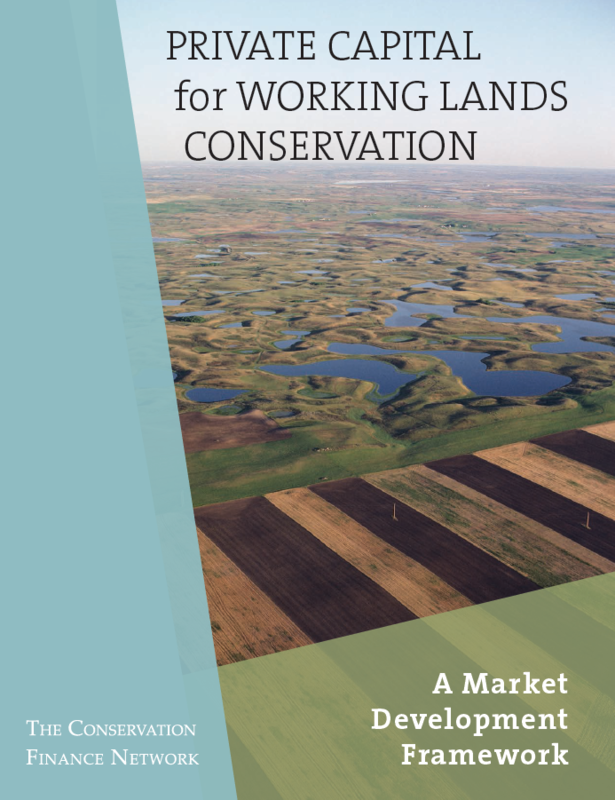 By distilling the roles and deliverables of market maturation and highlighting how relevant stakeholders may better structure partnerships and efforts, those involved may be able to accelerate the pace and scale at which private capital is leveraged for conservation outcomes on working lands across the Unit­ed States. To comment on this announcement, please post in our LinkedIn group. You may also email the authors of any of Conservation Finance Network's articles via our contact form or contact us via Twitter.